The whole lubricant production is done at our fully-owned production plants and R&D laboratories. We produce world-class lubricants using the best-grade of petroleum base oil (Group III) with highest quality additives. Our lubricant production units utilise the latest technology of modern lubricants production in the world. Each production unit is equipped with a production laboratory to ensure high-quality lubricants. 270,000 kl/ year of installed capacity using modern blending technology, namely Automatic Batch Blending, Inline Blending, and Simultaneous Metering Blending. This unit produces automotive and industrial oil, grease, viscosity index modifier and specialty products, such as grease and metal working fluids. 85,000 kl/year of installed capacity supported by Batch Blending. This unit produces automotive and industrial oil. 120,000 kl/year of installed capacity supported by Automatic Batch Blending, Inline Blending and filling process that generate high-quality products, accurate volume, automated recording and high-speed production. This unit produces automotive, industrial oil and viscosity index modifier. 60,000 kl/year of installed capacity supported by Batch Blending. This unit produces automotive and industrial oil. The production unit is also responsible for providing raw materials, auxiliary production materials and involved in the optimisation of production facilities. Each production unit is supported by laboratory facilities to perform product quality testing. Our Oil Clinic Laboratory experts inspect the quality of lubricants to ensure the products meet international requirements. We ensure the top-quality products by performing engine with road tests, ensuring proper lubrication applied to the customers’ engines and machineries to protect heavy-duty machineries. Moreover, Our Oil Clinic Laboratory experts also assist customers, especially large-scale industries, to evaluate lubricants used for their engines. 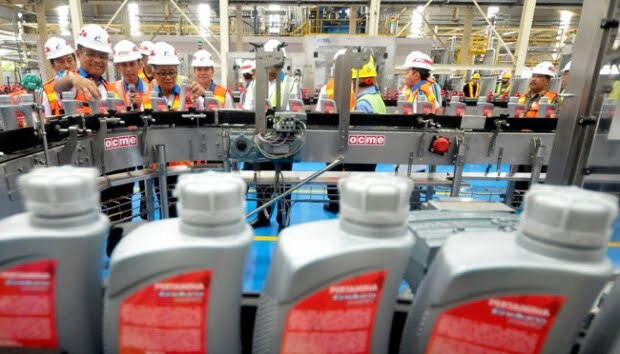 To ensure our products meet the qualifications of world-class car manufacturers, Pertamina Lubricants also conduct several join development programs with leading automotive industries, among other companies, Toyota and Daihatsu. On the other hand, we also manage to keep up with the dynamic updates of lubricant and additive technology development to fulfill worldwide qualification standard. We produce best-in-class products and productivity services for global lubricant business, conducting evaluation, assessment & development to create superior and competitive products that meet customer expectations. We apply a secure and professional distribution process to ensure our products delivered to customers in its best conditions. 27 Supply Points to assure the security of product supply to consumers in accordance with the type, quantity, price, and location.